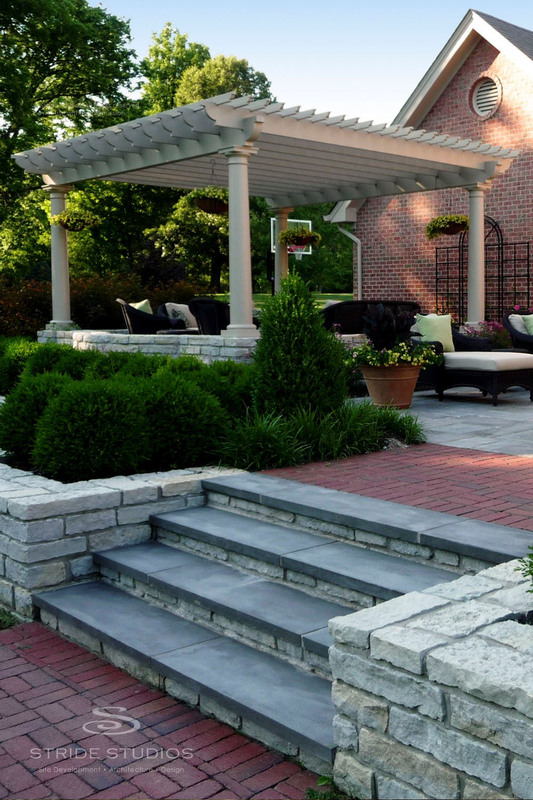 we transform your dreams into exquisite outdoor spaces. 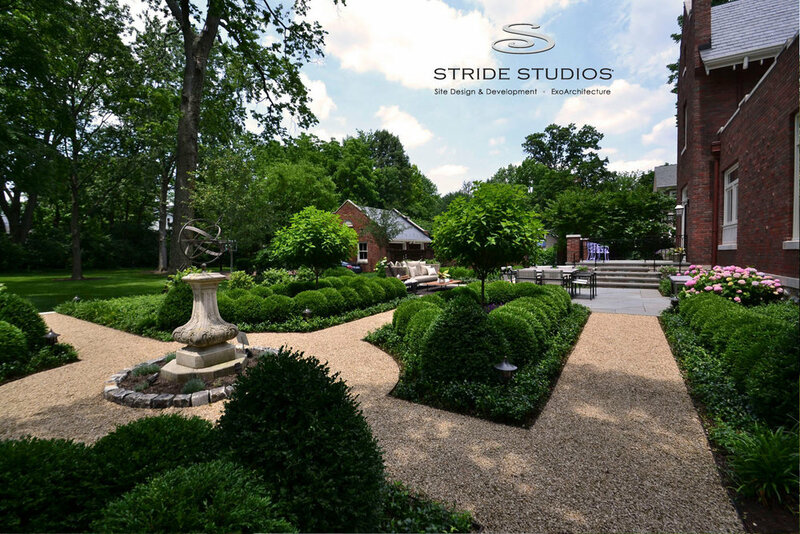 From simple conversation nooks to breathtaking focal points and master-planned estate grounds, take a look at some of the ways Stride Studios has transformed outdoor and indoor spaces (and everything in between) for our discerning clientele. We're proud to share some of our finished projects. It's not what you're used to. The breadth of our services and talents goes well beyond specifying plants and pavements. 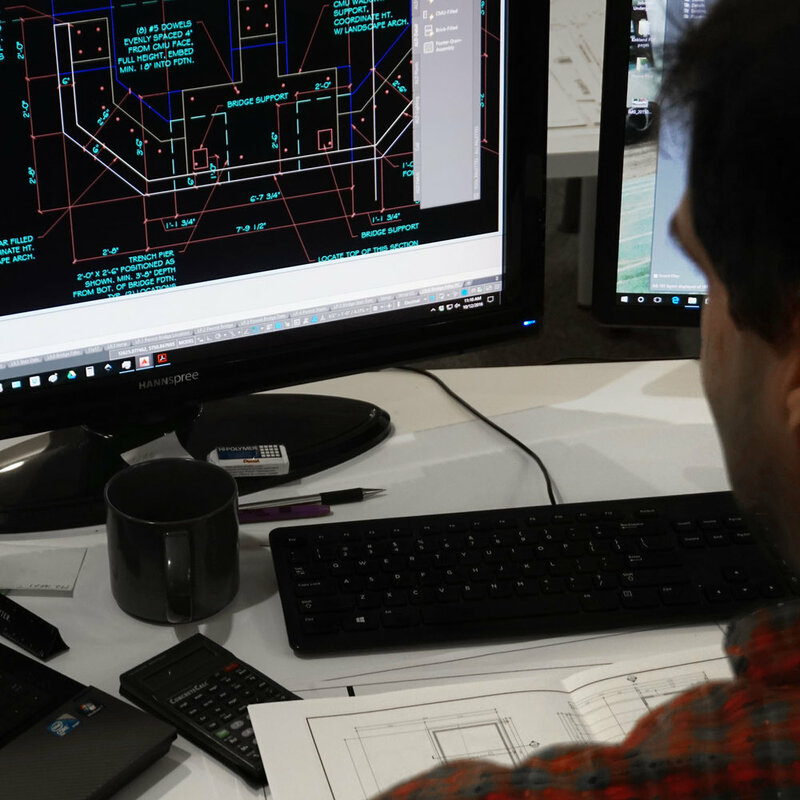 We're site designers who incorporate all aspects of your vision, from drainage and infrastructure to garden ornamentation and accoutrements. We can dream it and we can build it, and this is how it happens. We're artists—all of us. Some of us are experts on structural elements. Others spend hours deep into the night drawing your dream entrance with great detail. Some bury bones. And others are geeky for gardens. Take advantage of our broad range of experience and skills. We're together in this for a reason. The emotional tone of the property coupled with the client's wishes created the ideal framework for the ultimate design and installation of the project. The homeowners had engaged in a two-year interior renovation of their home—their attention to detail quite evident—and Stride Studios wanted to put as much effort into the exterior as the homeowners had put into the interior. With the advantage of starting from scratch, we were able to meet all of the client's desires, which included sculptural focal points, privacy barriers in the form of walls and trellis panels, multiple terraces and destinations, a sports court, a new driveway, and colorful gardens that use traditional design elements such as boxwood parterres. The clients were adamant about using high-quality materials such as wrought iron, stone flagging, granite cobbles, and clay brick. The final outcome integrated their wish list and went on to include a brick fence, arbor with bench seating, and a crushed limestone path which leads visitors around to the side of the house. The home, built in 1947, was designed by Carl A. Strauss, one of Cincinnati’s finest and most prolific Post-war Modernist architects. The incredibly unique home was nestled into a hillside with a view of downtown Cincinnati and the Ohio River. One exterior amenity, an existing swimming pool, was located on a hillside just below the home's first level. The pool, the pool deck, and the supportive retaining walls, were all in need of repair and rejuvenation. We set out to assist in the renovation of the pool and the space. 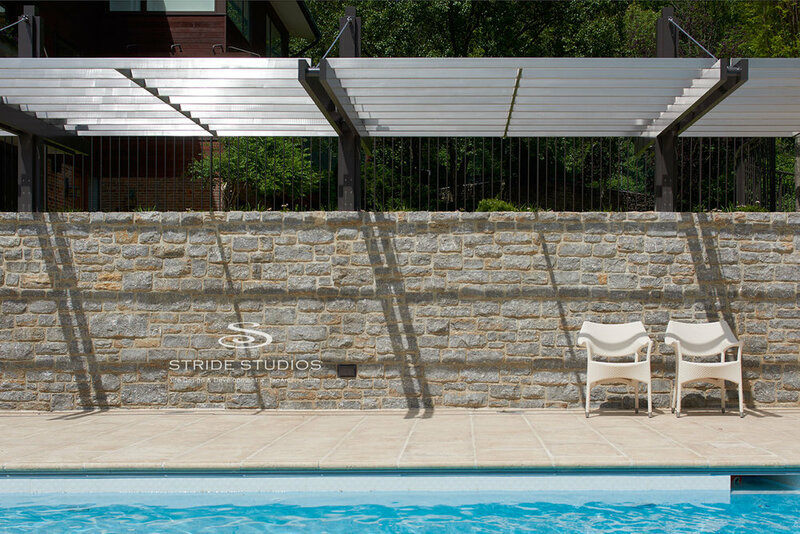 Our client desired the addition of a pool house and spa at one end of the swimming pool. The collaborative efforts of the design team made this project special. Everyone involved in the project including the homeowners, the architects, engineers, interior designers, general contractor, craftsman, and everyone in our office, worked together to create a chic, modernistic space for our clients to embrace and enjoy. The original site contained a dilapidated house on 3+ acres. Our client's wish for the property, neglected for years with multiple damaged trees, was to transform it entirely, ensuring the grand house and landscape would be sophisticated and complimentary to the land and neighborhood. They envisioned a dramatic journey leading up to the home's entrance with stylish pathways wrapping around the home's footprint. They also needed a solution to running water, from three adjacent properties, which continuously streamed across the center of the property and driveway. Our intent was to meet the client's needs as well as provide solutions for many other intricacies associated with a project of this scale. We developed structural features which reflected, extended and accentuated the architecture of the proposed home. We chose materials appropriate for the property, and selected plant material to fit the client's requirements while maintaining sensitivity to the ever-present wildlife. The stunning drive lets visitors know that something special is just around the bend. The family decided it was time to bring their dull, sloped and under-utilized back yard up to par with the rest of their home. They desired an upgrade that was an extension of their beautiful house—a place to entertain and an area more conducive to kids' play. Sweeping terraces with wide walks, and steps anchored by quarried stone walls, transform the drab drop-off into a multi-layered vista. Wide turf panels separate the lower grassy and terrace areas. A rich, green lawn visually highlights the tailored look of the stone walls. With a pergola for shade and visual structure, large terracotta planters similar to those seen at the great Biltmore Estate, and architectural details paying homage to the existing home's elegance, this transformation makes the transition between home and garden seamless. This was a two-part project. First we had to determine the perfect place for a fountain our client had found. The fountain was not large enough to be placed in the middle of her expansive front yard, and the side yards were about to go under major construction. That inspired us to create an interactive space left of the front door. We established a walkway of crushed red clay brick chip, red clay brick inlays, and multi-dimensional clay brick edging that led down to a patio which became the fountain's new home. This area serves as a resting place to take in the extensive front yard and expansive English-style perennial beds. There is a looseness to the patio area that makes one want to spend time, yet it adheres to the classic lines and formality of the house. It is now a a place that our avid gardener can plant small perennials and herbs to fill the nooks and crannies as she sees fit. Once that goal was achieved, we renovated the rear yard.